Let's hear from the 450 riders, 250 competitors, and team personnel after Utah. "The track conditions were crazy and dry, but the track crew did a good job. I had no idea about Jason. Obviously towards the end I was going through lappers, and I knew Jason would take it easy today to get points, but I only knew how he did when the race was over. I'm excited to head to the final round in Vegas next week." "It took me a while to find my groove in the main," said Tomac. "Once I found it I was able to make a lot of passes and catch the leaders. The crash was unfortunate, but I'm pumped to still finish second. Once again, the fans were awesome here in Salt Lake and I could hear them with every pass I made, that was so cool." 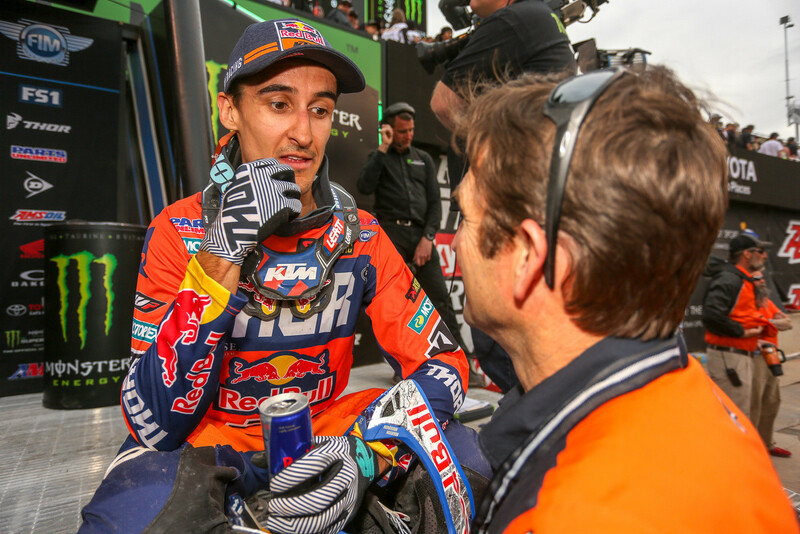 "It was a good race," said Baggett. 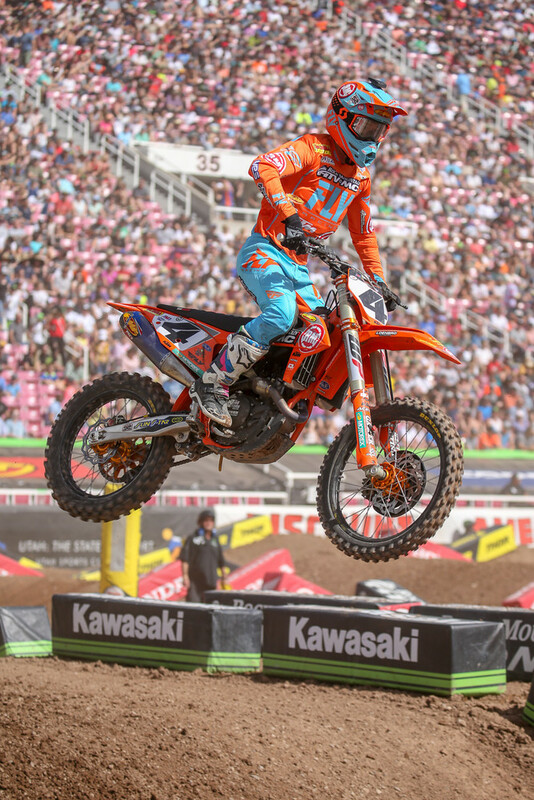 "My starts were solid, and it felt good to grab that holeshot and to get back up on the podium. I'm ready for Vegas and to finish the season off strong with another podium." "I made some mistakes in practice and had to regroup in order to go out there and do a good heat. In the main I thought, ‘I'm just going to try to get a good start and stay up there with those guys,' which is exactly what I did. I latched onto the top two and put in my laps. It was a long main, especially on this track. I stayed with [Blake] Baggett for as long as I could. Eli [Tomac] was just on a mission. He passed me but fell, and I thought I might get a podium if he stayed down long enough. He got by me again, but it was a fun race. I've had some bad races since Daytona, and you begin to wonder if the Daytona ride was a fluke. It feels good to back up that fourth place." "It was a decent day overall with really good practice sessions for me. I was happy heading into the races. In fact, I felt the best I have in a while so I know the speed and fitness is back and the Yamaha was working really well. In the main event, I got off to a decent start and pushed in the beginning of the race to get in touch with the top-three. I had a couple good battles in the beginning of the race and then I rode a little bit tight at the halfway point. Toward the end of the race, I found some better lines and loosened up a bit and rode a lot better. But, it was too late to catch a podium position and that's frustrating. I missed a good opportunity to stay up-front all race and I'm not stoked on that. The podium in Vegas is the goal and I definitely have the speed, I just need to put it all together in the main event. "It was the same kind of deal as last weekend. I felt good all day. I went into the main event expecting to be on the podium. The start wasn't there again. I got antsy. I didn't leave too late, but had a bit of wheel-spin in the dirt and got tangled up in the first turn. From there I had to play catch up. With the track being so slick and difficult it was hard to make up time. I settled in and finished seventh. It wasn't the best weekend, but I had some speed. I am putting the pieces together. With one Supercross race remaining my plan is to get a good start in the main and put my Suzuki on the podium." "I rode well out there," said Bloss. "Tonight was a big step in the right direction. My speed was there, and even though I had to work my way from the back of the field, I am excited about my ride. I am looking forward to Las Vegas and putting in another top-ten ride to end the season on a high note." "It wasn't the best day for us, but it wasn't the worst day," said Bowers. "I struggled with traction all day today with the dirt being so rocky, but a top 10 is solid after a day like today. It was also good practice for Vegas conditions next week. 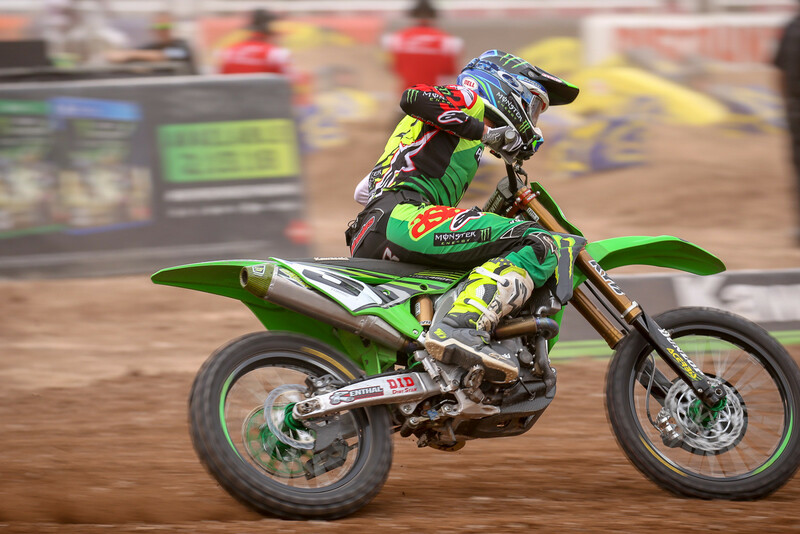 I feel very confortable on my KX450F right now and I'm looking forward to finish the season off strong." "I felt amazing on the bike and qualified fourth," said Wilson. "I didn't get a great start in my heat race, but I came back to fifth and was feeling good for the main event. I had around a top-10 start in the main but then was cleaned out by another rider and had to go to the mechanic's area. I only made it up to 13th, but there was nothing I could do. I'm just going to come back strong." "Overall, I was looking for more. I felt at home on the Suzuki RM-Z450 and was moving in the right direction, but I had a crash that set me back. The conditions were tricky. We're going to move on and make the most of the last round of the Supercross series in Las Vegas. I want to finish the season on a high note." "The weekend in Salt Lake City started off a little rough, I didn't qualify very well out of practice and didn't make it to the main out of my heat race but I bounced back in the LCQ and got the win, which actually gave me some better ideas about racing lines so I could improve for the main. I ended up stalling on the second lap of the Main Event and that put me in last place, immediately. I could only pass my way up 16th by the end. I definitely felt the elevation and the track was really challenging. This weekend is something I can build on and I'll feel a lot more solid and ready to race in Vegas. "I was pretty good in practice all day," said Anderson. "I had a solid heat race and qualified well. I just went down in the first turn in the main and had to go all the way around the track. I broke some spokes in the first turn and had to come into the mechanics area to get my front wheel changed. By that time I was two laps down. I was able to unlap myself and get up to 17th and at least get some points. I'm going into next week in Vegas with a 14 point lead." "At some point in the race I almost had to ask myself, ‘Am I going to do it again? '," said McElrath. "The whole team worked really hard this week to dial in the bike. They really blow me away with how much they want it and it pushes me harder when I'm out there to give them the win. I'm really blessed and thankful to be here (on the podium)." "I had a great day," said Cianciarulo. "I felt amazing on the bike today and nearly had the win tonight. I believe my riding and speed were there but I didn't get the start I needed. We'll take this momentum into Vegas and give it everything we've got." "We had a good shot at making up a lot of points today, but couldn't quite get it done," said Savatgy. "Overall, the bike and the team were on point and we're still in contention for the championship." "Felt good on the bike all day and qualified fourth out of practice. I was happy with my riding," said Sexton. "In the heat race, I got the holeshot but hit neutral going into the corner which let AP (Plessinger) around me. I pretty much just followed him the whole race besides for a mistake on the last lap which gave him a gap. Ended up second. Going into the main I felt good and was ready to get my first win but lined up a little too far outside which was my fault and got pushed wide. Fought my way from mid pack to fifth. For awhile I was right on the front four but unfortunately I made way too many mistakes which left me with a fifth. Not a good night but not a bad night either! I'm putting my head down this week to come out swinging in Vegas to the season on a high note!" "Honestly, the altitude was difficult. Fortunately, we had the ability to find a variety of setup options that really worked to our benefit. I made some quick passes in the main and was on the tail end of the leaders. Late in the main I had a few bad passes through the whoops, which took me out of it. I was within striking distance. The chassis on the Suzuki RM-Z250 worked really well, and I'm happy to get my best finish of the season." "My first two practices went really well and I felt confident," said Harrison. "I crashed twice in my heat but got back to ninth and finished with a solid ride. Then I went down in the first lap in the main, but I came back strong to eighth. I can't complain. I'm making gains so I'm happy." "We're really closing the season off on good notes," Chisholm said after the race. "I feel like we were running up front all day and I had one of my best heats of the year finishing in fourth. I was putting in good laps in the main, but that one little mistake sent me off and I had to spin around on the start straight. I lost some time but I'm happy I landed another top 10 and closed in on more points. One round to go and I'm excited to end it with some momentum moving into the summer." "I was feeling good, but then jacked my foot up in practice. It was muddy and I framed the triple. I was chasing the leaders in the main event, switched up my line, and came up short again on a jump. After that I was riding around cautiously. Initially I thought I broke my foot. There was no way I was going to pull off, but my result suffered. My foot seems to be okay, and I plan on racing the Supercross finale. It's a bummer deal, but that's how it goes." "I've been working really hard and feel like my results won't show that tonight, but I felt awesome all day," said Mellross. "Qualifying and Heats went really well and I posted some of my best times of the year which is a big plus for me. I think I brought the intensity tonight but disappointed with my Main, the way I approached the second set of whoops, but I'm ready to finish off the season on a positive note next weekend." "Peick had an awesome day. He got tangled up in a start, but would have done really well. He fought hard all of the way up to seventh. Stewart had a tough time in the whoops. Nicoletti rode well in the main and ended up sixth. Hill cased a jump in the mud and hurt his foot. He was riding well in the main, but tweaked his ankle again." "On Friday, we visited a Wienerschnitzel restaurant in the Salt Lake City area and did a takeover, where the team helped out. The guys were having so much fun, in fact, that they worked a half hour longer than they were supposed to! They worked the cash register, did the drive through, and made the food. Everyone had a good time. The Suzuki dealer signing also went very well." "I think Christian learned a lot today. In practice he had had a pretty hard crash, made some mistakes, and had a few issues, but he learned from that and turned his day around. He got a good start in the main and rode solid. Now we need to carry that momentum into next week and finish out this series strong to carry some confidence into the outdoors." "It was a good day. It got off to a rough start with a couple of crashes in practice and some repairs, and it would've been easy for Christian to roll over. Instead, he gathered himself up and had a decent heat race and a good main. He got a good start and looked like he was going to make a pass for the lead through the whoops in the first couple laps. Justin Barcia made a push at the end, but with three laps to go, Christian dropped his lap times by almost a second and showed a lot of fight. I think it's the best ride I've seen out of him on a 450, and maybe even a 250. I'm proud of him for how he rode and proud of the team for helping me to get everything done." 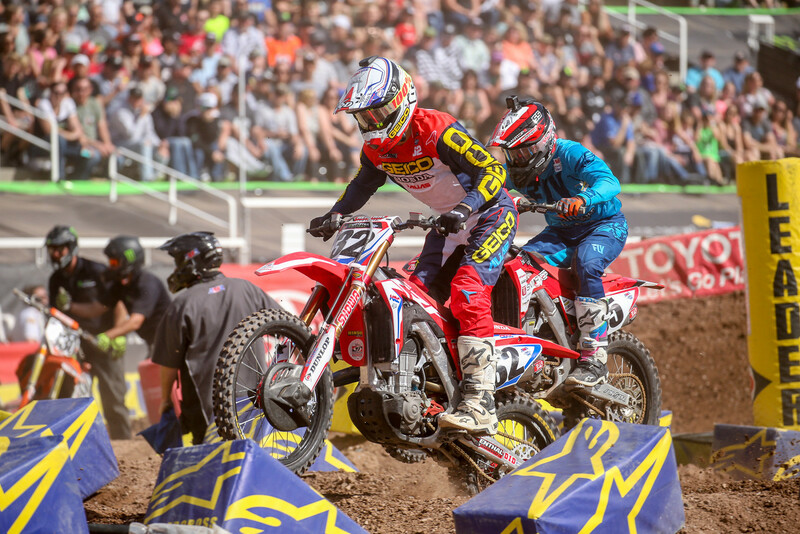 "Justin Barcia put in a solid top-five finish on a brutal track in high elevation here in Salt Lake City. Justin made progress throughout the day adapting to track conditions and the elevation and we looked good to be in a solid, podium-finishing position. However, we were set up in a bit of a tough spot with gate picks after Justin struggled off the start of his Heat Race where he finished fifth. Once the Main event started, Justin put some speed in early but struggled with a couple things on the track. His top-five finish is solid, but not quite the finish we were hoping for. It's a little disappointing because we have a podium finish in us and we let it get away today. For Josh Hill, he struggled with speed and track conditions all day. He had to go to the LCQ after failing to qualify from his Heat Race, which he won, which was a good confidence booster. But once the Main Event started the track conditions just didn't play into his favor and he struggled throughout the night. We're putting Salt Lake City behind us and heading into the final race in Las Vegas next weekend with a strong push to finish out on the podium."